What would you do if you came face to face with a grizzly? Pick up the nearest vegetable, of course. A WOMAN IN Montana, US, was awoken on Wednesday night by sounds coming from her back garden. 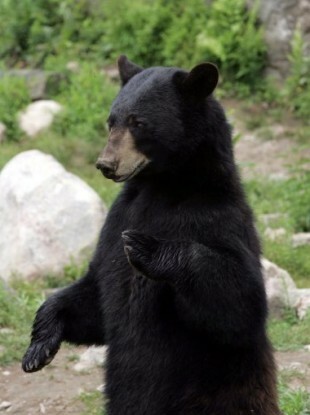 She went to investigate and was faced with the sight of a 14st black bear attacking her 12-year-old dog. When she screamed, the bear turned and charged at her – swiping at her legs. By “improvising” the sheriff meant running the kitchen door and throwing the nearest thing that came to hand – which was none other than a 30cm long courgette. It doesn’t sound particularly terrifying but it seems to have worked. The vegetable hit the bear on the head, at which point it promptly fled. The woman has not been named and it has been reported that both her and the dog only suffered light scratches. Local authorities are still trying to track down the animal. Email “Woman fends off black bear… with a courgette”. Feedback on “Woman fends off black bear… with a courgette”.